Japanese Episode AG 181: "The Curtain Raises! The Pokemon Contest Grand Festival!!" American Episode 451: "May, We Harley Drew'd Ya!" Haruka and her friends have arrived at the Sekiei Plateau, the site of the Kanto Grand Festival! After registering for the tournament, Haruka calls her mom from the Pokemon Center to let her know that she made it there safe and sound. After the call ends, the Aipom from the mountain appears and starts to take everyone's hats! Luckily, Shuu and a Coordinator named Saori appear to prevent the pokemon from doing too much damage. After the monkey pokemon runs away, it is revealed that Saori came from Takeshi's hometown. She also reveals that she's known Shuu ever since he started his quest and has been keeping up with him as his rival ever since. As Saori reveals all this, Harley, in disguise, delivers a threatening message. Later, the opening ceremonies of the Grand Festival commence. Lillian reveals that the competition will be whittled down from 270 participants down to 64, an idea that makes Haruka nervous. Luckily, her Wakashamo's use of a fighting-type move when the judges were expecting a fire-type move earned her a spot in the second round. Likewise, the duos of Shuu and Amemoth, Saori and Lapras, and Harley and Jupetta impress the judges enough to earn a spot in the preliminaries. The next day, the second round of the Appeals round begins. As Haruka watches Shuu bring out his new Absol, she worries about her chances of winning the coveted Ribbon Cup. To be continued! The Grande Festibol! While this isn't really all that different from the one in Houen, that's not really a bad thing since the Houen one was pretty decent. I wish this episode had more references to the past the way the other one did, though. But with only like two new Coordinators in this region, the anime producers probably didn't think there was any point. Saori was an interesting character as well. She did a great job of filling us in on some of Shuu's past especially since this will probably end up being Shuu's last saga as a main character. I also liked the fact that Lillian told us that Shuu is from LaRousse City because it, like the two-part Deoxys episode, reminds us that the movies and the TV series really do take place in the same continuity. And then there's Harley. You can't talk about this episode without mentioning "Mayley" (who, as far as I could tell, wasn't given a similar nickname in the Japanese version). It was pretty hilarious, and the music used in the Japanese version really helped drive home the point that pretty much everyone except Saori thinks Harley is a creep. 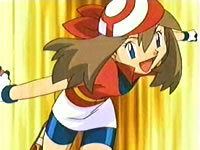 The dubbed version gives us the first dubbed-by-Pokmon USA appearance of Caroline and Vivian. It's weird because I keep forgetting that there are characters in this show who haven't showed up in the new dub yet. Anyway, Caroline really sounded off to me, but I guess Vivian was alright. The dub also manages to use the Pokemon Contest theme, so that's always nice to hear. Gallop, Teppouo, Pichu, and Mantain keep their Japanese voices. Boy in crowd: "Cut out the Mankey business!" I know they've taken phrases with animals in them and replaced them with pokemon names plenty of times before, but this one stuck out as being particularly moan-worthy for some reason. Solidad: "See, I think since he's been watching you grow stronger in your performances, he's gotten feelings for you." I don't quite like the way PUSA worded that sentence. It sounds like Solidad's saying that Drew developed romantic feelings for May when, really, she means that he's developed strong competitive feels toward her. Big difference. Finally, when Harley reveals his Haruka costume, he calls himself "The Bad Angel, Harley." He doesn't say this in the dub. The TO BE CONTINUED... is a bit longer in the English version than it is in the dub. Also, the music that plays in the dub during the scene is indeed a piece of Japanese music, but it's not the same piece that was playing in the Japanese version! So basically, PUSA replaced one piece of Japanese music with another. How's that for random?